What’s in season in California this June? Many, many beautiful flowers that you can give to someone special or display in your home. If you’re looking for fresh, local flowers that you can easily get in California during the month of June, you’ve got at least a dozen solid varieties to choose from. Keeping things simple and buying flowers that are local to you means that you’ll probably save money on flowers and you’ll likely find the most beautiful blooms with the most longevity. Buying domestic, instead of having flowers shipped to you (or your gift recipient), also allows enjoyment of sustainable blossoms. Purchasing flowers that are grown in your hometown – or close to it – minimizes the environmental impact of farming flowers, which is a nice way to give a gift to Mother Nature while you’re gifting others. Peonies – Peonies are native to Western North America, so you don’t have to depend on having the Asian or European varieties shipped to you. Tulips – Tulips aren’t just for Easter. Enjoy these California beauties well into summer! Roses – Did you know that there are more than 100 species of roses, and many of them grow abundantly in the Western United States? Pomegranate – Some people don’t realize that pomegranates flower. They’re not only a fruit. They put out gorgeous orange blooms. Yarrow – Yarrow thrives in temperate climates, which is certainly what you’ll find in California during June! 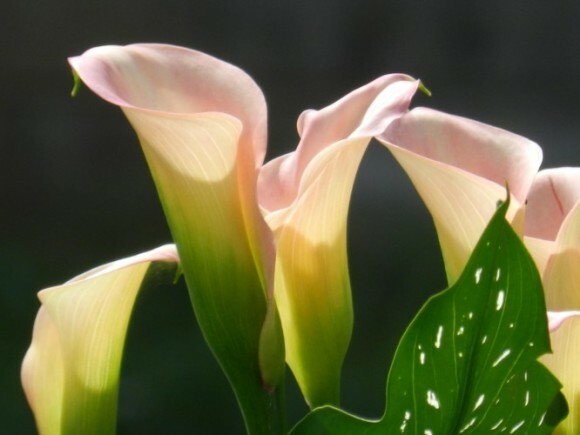 Calla Lilies – Calla lilies are also called trumpet lilies, arum lilies, and pig lilies – and they’re easy to find on California days during June. Lilies – Lilies are herbaceous flowering plants that grow from bulbs, and you’ll find them springing up all around during late spring. They’re special because they’re an important part of culture and literature. Veronica – Also called speedwell, Veronica is the largest genus in a plant family of 500 species and a flower that’s local to many California cities. Pincushions – Alternatively called scabious, pincushion flowers are in the honeysuckle family and they’re California blooms that we love! Of course, there are plenty more flowers that you can find in California during late spring. What are some of your favorite flowers to buy during June? Leave us a note in the comments below telling us what you’ve purchased or what you’ve given.